Biblical truths to help set you free from overeating! 15 simple tips for the Christian and a free 5-day overeating Bible Study printable to help you stop eating too much and put your faith in your food choices. As we read the Word of God we may find ourselves shaking our heads vigorously in agreement only to end up utterly stumped by how to apply these principles in real life. Overeating is a prime example. The Bible has numerous verses that speak to the topics that encompass how to stop overeating (self-control, gluttony, and casting our care on God) but how does one actually use the power of these promises to help them shut the ice cream tub when they are no longer hungry? In this overeating Bible study, you will find 15 tips taken directly from the Word of God. Each of the 5 verses has 3 practical tips and one short paragraph from the Bible to study on your own. To really seal these principles into your heart, CLICK HERE to download your FREE 5-Day Bible Study PDF. Before you continue, pray for the Holy Spirit to prick your heart with which idea will help you the most in this season. If you are anything like me, you will read this list and identify with each and every point. Then, you’ll see that there is so much to be done, you’ll get overwhelmed. Rather than getting stuck, look for your most effective strategy. Next, practice it a few times before moving on. This is how we move away from the diet mindset and find true freedom in Christ. 1. Put on your new nature. Think of how a naturally thin person would handle this situation. How would someone completely free from an attachment to food handle a stressful day or a half-eaten pie on the counter? Imagine what would happen and try that behavior on for size. Your new nature IS free from sin; you can walk in it by faith! Faking it ’til you make it can be a spiritual practice. 2. Ask God for His peace. As darkness cannot exist in the presence of light, a binge never happens in a peaceful environment. If you feel the desire to dive headfirst into a plate of brownies… don’t fight, turn on the light! Don’t wonder where your peace is, ask for it! (Matthew 7:7, Philippians 4:7). Then, seek out practical ways to find calm such as going for a walk, turning on praise music, or shutting yourself in the bathroom. 3. Put on Praise! Right now, wherever you are, standing in your struggle- praise God! It is ok if you don’t feel like breaking forth in glorious praise, really. Any effort will do. Look around, find something that you are grateful for and tell God. And do it again, and again, and again. This is medicine to a weary soul. 4. Make a decision. Embrace your freedom of choice. Although when faced with a demanding desire to eat, a choice may feel like the last thing we have, the Bible tells us that we have NO obligation to our flesh. Let that sink in. No matter how drawn you feel to the food, you 100% CAN say “no!” with God’s help. Not sure? Try it and see what happens! 5. Let go of your fears. If anxiety and fear are propelling you to seek comfort in food, acknowledge that your kinship with God ensures that He will take care of you. You are not His casual acquaintance or unappreciated employee; you are His child. We take care of our children and have a God-given desire to not only meet their needs but to bless them. God hasn’t forgotten your situation; He will take care of you. Envision yourself curled up next to your Heavenly Father where safety is the only feeling you can know. 6. Let God love on you. Here we are instructed to call the Creator of the Universe “Abba,” or in our modern language- “Daddy.” While we may never address the Queen “Hey girlfriend!” or ask the President “what’s up buddy?,” God encourages us to have a relaxed and loving relationship with Him. Love and acceptance trump overeating. You can find both with Him! 7. Pick a fruit. We have been given clear evidence of the work of the Holy Spirit. Read over the list above and pick a fruit (to walk in). Maybe what you need now is patience with your children or faithfulness with a difficult job. See it and DO it. By doing so you are stepping out of your flesh (overeating) and into the Spirit. 8. Imagine the cross. Close your eyes and picture our loving and sinless Savior on that cross on that dark day. Look Him in the eyes and reach out to touch His bloody feet. This isn’t an exercise in guilt, it is an exercise in grace. He died for our overeating. What is the least we can do for Him? 9. Ask your Guide. We have been given the Holy Spirit to direct us in every single step that we take (John 14:15-17)! Isn’t this exactly what we are longing for! If uncertainty and “overwhelm” are prodding you to eat, reach out to the One who is there to help you navigate your life. But you have to ASK. 10. Put on thankfulness. As you contemplate eating more than your body needs, stop and thank God for the food. While praying won’t turn a sinful heart pure, it will turn our hearts toward God. Thankfulness softens our firm resolve and opens our hearts to communicate with God through prayer. If your heart is feeling hard, thankfulness will help you get to the place where you are more willing to ask for overeating help. 11. Watch for justifications. Are you debating with yourself about what to eat? Maybe you are relying on worldly wisdom to justify eating, saying this food is “low calorie,” “low fat,” or “healthy.” Try to keep this debate off of the specific food and direct yourself towards the heart. Doing so will help you walk in integrity and that, my friends, will fill your spirit with joy that overcomes your desires. 12. Train like it matters. I get it, not eating is not easy. If it were easy to make self-controlled food choices, the size and shape of the people around us would look a lot different. We aren’t training for smaller jeans, we are training for something bigger- godliness! Think about the importance of your choice to eat in your training. Athletes make hard choices with their bigger picture in mind every day. Envision your desired end result and choose to make one decision to push towards that goal today. 13. Find the joy. In the midst of a struggle, this probably sounds like the worst suggestion ever. However, have you noticed that when we need something the most is when we want it the least? This trouble you are experiencing, it is for your greater JOY. The refinement that will come from these battle wounds will make you into the Christ-follower you long to be. Embrace the lack of comfort because fighting it is often more painful than the discomfort itself. 14. Ask in faith. Do you believe God? I mean, do you really believe what He says? I tend to have faith for big things but small life details– I’m apt to act as if I’m on my own. But God promises to be our strength. He says that He will fill us with the fruit of self-control. It is our job to ask, expecting Him to answer. Pray and act as-if. 15. Stop wavering. You know that battle in your mind that wavers between “eat!” and “don’t eat!” Yeah, stop it. If we are less than 100% set on a making a difficult choice, it’s going to be HARD. Notice your lack of resolve and make your mind up completely that you are not going to eat when you are not hungry this time. I think you’ll find that the choice itself feels like a relief simply because you made a decision. 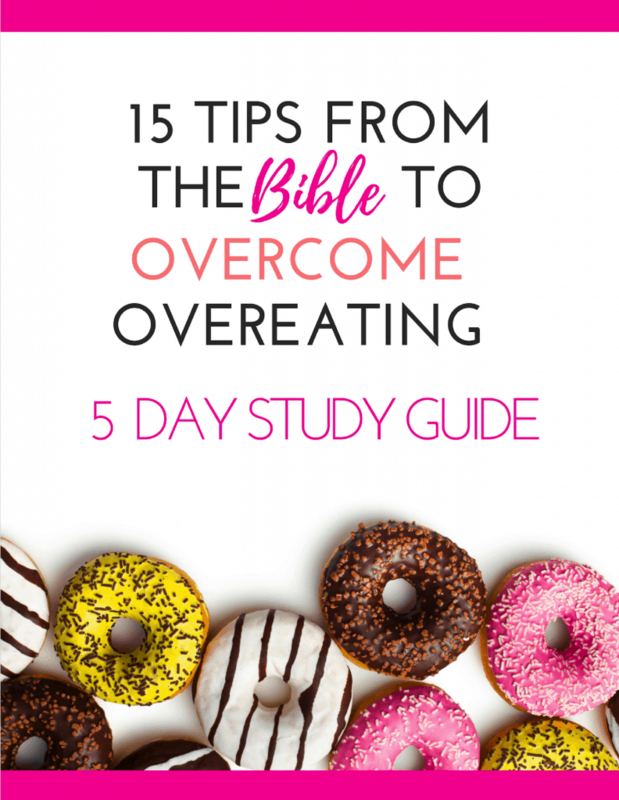 Download your FREE 5-Day, 15 Tips From the Bible to Overcome Overeating Bible Study below. Print out the overeating Bible study and complete one section each day. As you are journaling, look for particular habits that you would like to apply to your life. Commit these changes to God through prayer. If you need additional support in adopting these new practices, use The Ultimate 12-Week Healthy Habit Goal Setting Planner to set realistic goals that you can successfully complete each day. So there you have it, 15 awesome tips that can lead to more food freedom in your life. While we know that no one practice is your “answer,” JESUS IS, these strategies will strengthen your relationship with Him. Then, as you rely on HIS strength when you feel weak, you will truly be made strong! « What Does God Say About “Failure”? In #3, I learned to do what 2 Chronicles 20:22 says [my paraphrase]: When they began singing and praising, the Lord set ambushes against their enemies and defeated them. I’m not naturally a musically inclined person, but this really helps. Such a great point! Walls fall DOWN when we praise God. Thank you for chiming in! I love this . Thanks for sharing . 4. Make a Decision is really powerful to me! This is a great reminder that as a believer in Christ we are no longer enslaved to sin. We have the ability to say no to overeating and we can turn to God for peace and comfort. Thank you for this Brandice! Oh boy, number 4 was a huge revelation for me! It is so easy to feel swept up in our cravings and forget that we are indeed free. I still forget to remember this sometimes 😉 Thank you for commenting! Number 3 has really helped me. I turn the volume off the workout video I’m using and put on gospel music and praise the Lord while I excersize. Easiest workout I’ve ever done! I was doing it for God, not myself. LOVE this! It turns a dreaded activity it to something to look forward to. Thank you for sharing! I love all the tips . Number 9 is my favorite . Thanks for chiming in Neely! Hi Brandice! Thank you so much for this article. I love how you mentioned not focusing on the size of my jeans as a motivator for a healthier lifestyle, but instead focusing on being more godly in all the areas of my life… including how I eat. I enjoyed your words so much that I included you and a link to this article in my latest article on the importance of fitness for the Christian woman. I pray that God will continue to bless your ministry here. I’m just beginning to try to loose weight. I’ve tried several diets. I made the decision about 2 weeks ago to put God first & ask for his help this time. To my amazement when I looked at my phone this morning, there you were!! Thank you for what you do. Ill keep in touch on my journey.